In February 2013, the Institute of Contemporary Development published a report titled eDiplomacy. The Beginning by Sergey Kulik, Director for International Studies. The “network power” parameter has increased its role in the framework of traditional parameters of the “balance of power”. Now the need has arisen to draw the attention of the Russian political and expert communities to the potential of such new technologies, which can be engaged in meeting foreign policy challenges and objectives, in strengthening the country’s positions and image abroad. A new book authored by Igor Yurgens and Sergey Kulik has been published by the Institute of Contemporary Development. It addresses such questions as what Russia’s European choice has meant in the past, what it has given Russia to date and how it could influence its future. 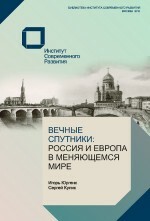 The monograph is titles Eternal Companions: Russia and Europe in a Changing World. The first part of the book is dedicated to the history of Russia’s relations with Europe over the course of more than 1000 years. The second part provides an extensive description of interaction between the Russian Federation and the European Union as well as individual EU members over the past decade. Particular attention is paid to the treaty and legal components of these relations. INSOR Management Board Chairman Igor Yurgens delivered an address about the future of “new countries and economies” at the annual political conference organized by the newspaper Nouvel Observateur in Havre, France. The main theme of the 2013 forum was the exit from the economic crisis and development scenarios for the world and France. The discussions participants include former French President Valéry Giscard d'Estaing, ministers of the current French cabinet, major political figures, economists and representatives of the arts from Europe and North America. A report on the conference is available here in French. Chairman of INSOR Management Board Igor Yurgens took part in the Munich Security Conference, which was held February 1-3. This annual event is a major international platform for the discussion of issues concerning security and peace throughout the world. Its guests traditionally include heads of states, foreign ministers, defense ministers, directors of major global, regional and government organizations, as well as authoritative experts. More than two dozen experts from think tanks and foreign policy institutes around the world gathered in Moscow for the regional meeting of the Council of Councils (CoC) on “Russia, Europe and the Future of Global Governance.” The conference was held at the Marriot Grand Hotel on December 12-13 and organized by the Institute of Contemporary Development (INSOR) and Council of Foreign Relations (CFR). The main theme of the conference was Russia’s G20 Presidency: Priorities and Goals. Other topics discussed included The Eurozone Crisis and the Future of the Global Economy, The Crisis in Syria and the Function of the UN Security Council, and Cybersecurity: What Institutional Reforms Are Needed? The annual German-Russian expert forum Formation of Social Policy held on Moscow focused on forms of participation for civil society in state budgeting processes. The forum was organized jointly by the Friedrich Ebert Foundation (Friedrich-Ebert-Stiftung) and the Institute of Contemporary Development (INSOR) with the participation of the Civil Initiatives Committee. Representatives of the Russian side at the forum included INSOR Management Board Member Evgeny Gontmakher, former Russian Finance Minister Alexei Kudrin, former Russian Minister of Labor and Social Development Alexander Pichinok and INSOR advisor Nikita Maslennikov, among others. 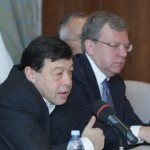 Chairman of the Management Board of the Institute of Contemporary Development Igor Yurgens spoke at Council of Councils regional conference: “Asia at the Crossroad: Regional Priorities for the Twenty First Century.” The conference was organized jointly by the S.Rajaratnam School of International Studies (RSIS, Singapore) and Council on Foreign Relations (CFR, USA). Evgeny Gontmakher, a member of the Management Board of the Institute of Contemporary Development, wrote an editorial commentary for the newspaper Vedomosti published on October 19, 2012. The doctrine that has formed in Putin's mind can be read if a number of significant events are analyzed. Can Economic Growth Be Socially Inclusive and Environmentally Sustainable? On August 17, Igor Yurgens participated in the Trilogue Salzburg 2012. This forum brings together political and corporate decision-makers, social entrepreneurs and visionaries, and leading think tank representatives from around the world. The Trilogue Salzburg has been jointly organized since 2007 by the Bertelsmann Foundation and the Austrian Ministry for European and International Affairs. A correspondent from the weekly Rossiyskie Vesti spoke with Chairman of the Management Board of the Institute of Contemporary Development Igor Yurgens about the current political situation in the country and how it might develop as well as about Russia’s foreign policy. — We last met long before the presidential elections, before the nomination of a candidate by United Russia. The people have spoken and a new political reality has emerged. Characterize, if you could, the current situation in the country.